Michael Sperone’s musical endeavors are ambitious and wide ranging. After his recent album release of Tintinnabulation, he is now composing a piece for the AM/PM Saxophone Quartet and is curating a new music workshop series in Jersey City with his group On The Cusp New Music. 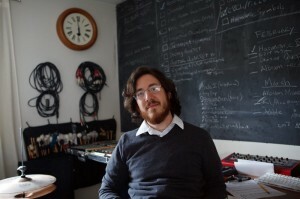 He recently presented his usage of his computer software patches in a workshop at Max/MSP Expo ’74. He identifies with a wide spectrum of music from post-war serialists composers to mid-90’s indie-rock bands – and is trying to incorporate influences from all worlds in a meaningful way. As a performer, he’s premiered works by Steven Ruel, Ron Mazurek, Payton MacDonald, Josh Lopes, and Nina Goede, and his work has been premiered by the NJPE, Joe Bergen, New Music Unit, and Justin Wolf.